The General Manager, and Co-owner of "The Pond", Lee, was lucky/cool enough to grow up on Abbey Road, North London, think The Beatles crossing the street, and has been in the restaurant and hospitality business for over a dozen years. Lee used to, many moons ago, play professional, and semi-professional football in the UK (that's Soccer to some of you!) and continues to have a huge passion for "the beautiful game". It’s one of the reasons you will generally find a game of something or another, Soccer, NFL, Baseball, on one of the 9 BIG SCREEN TV's at "The Pond". "The Pond" is a family, with the staff also featuring Lee’s son, Dominic, and you will feel the authenticity in effect whenever you come in. Being Celiacs, Gluten intolerant, it was really important to have an extensive GLUTEN-FREE menu, perhaps the biggest and most diverse in Texas and we look forward to making eating out a wonderful experience for the GLUTEN-FREE community. Check out the menu online. You are not just a customer or guest at "The Pond" - you are truly given the chance to become friends and family. 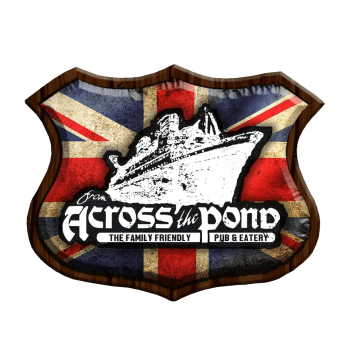 Come and "Cross the Pond".